As any dedicated Simpsons viewer knows, the fugu or puffer fish’s liver contains a deadly poison that must be expertly removed before the rest of the fish is consumed. This week, a market in the Japanese coastal city of Gamagori sparked a state of emergency after a supermarket erroneously sold five fugu fish before removing all of their toxic parts, the Guardian reports. Thanks to an emergency alert system blaring warnings about the puffer fish, three of the five fish sold have been recovered. But two remain in consumers’ hands. 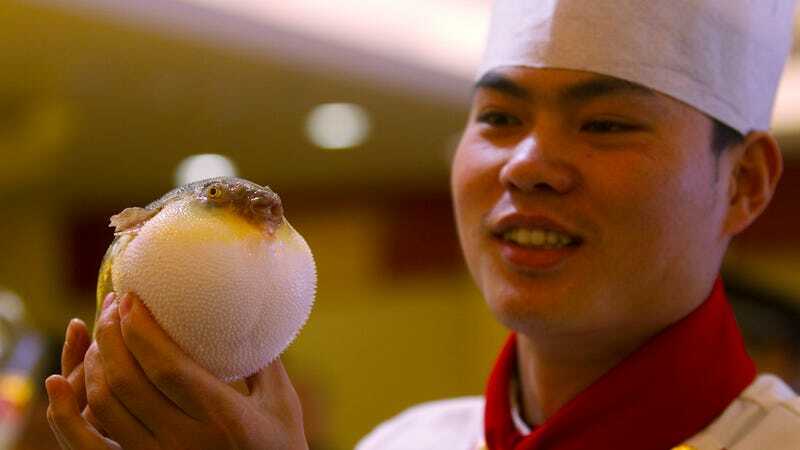 Fugu is considered a delicacy despite the potential dangers; for decades, the Tokyo prefecture required chefs to obtain a special license to serve the fish. That regulation was loosened in October 2012, allowing non-certified restaurants to prepare the fish as well (much to the ire of the chefs who spent time and money getting their fugu training). Finding the two remaining blowfish is a public health priority, as the toxin in their bodies can “paralyze motor nerves, and in a serious case cause respiratory arrest leading to death,” regional officials said in a warning statement reported by the Guardian. Best to turn down any fugu dinner party invitations until all the fish have been recovered.